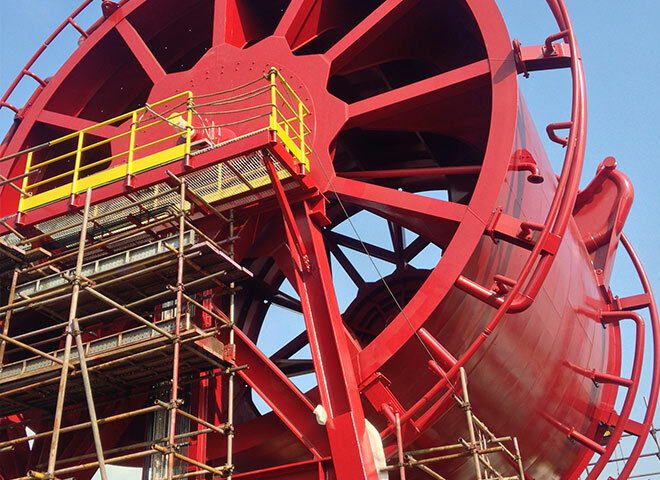 Techflow Marine is progressing with a Tandem Mooring and Offloading System for SBM Offshore’s Turitella FPSO. The FPSO (Floating Production Storage and Offloading) will operate in the SHELL owned Stones region of the Gulf of Mexico and is the deepest FPSO development in the world. The Stones development is located in 2,896m (9500ft) of water approximately 320km (200 miles) offshore Louisiana in the Walker Ridge area. With the main components delivered and installed, commissioning is scheduled for 2Q 2015. Techflow Marine has extensive experience and knowledge in the design and supply of this type of system, making the company the ideal choice for challenging projects. We take great pride in the quality and performance of our solutions, but that goes far beyond the equipment installed on the vessel. Working with Techflow Marine means our clients have access to industry leading engineering and after sales support during all phases of the project; from initial concept / FEED studies through to commissioning / first operation and beyond – providing excellent reassurance and peace of mind for our clients. 50 kboe/d peak production for first phase of development, from more than 250 million boe of recoverable resources. The Stones field has significant upside potential and is estimated to contain over 2 billion boe of oil in place. The FPSO Turritella for Shell’s Stones development is SBM’s ground-breaking move into the region. Due to start operations in 2016 it will represent an exciting new chapter for FPSOs, on several accounts. As well as being the deepest production unit in the world, it will comprise another SBM industry-first; a disconnectable turret with steel risers. The FPSO design concept was chosen to safely produce oil from the Stones ultra-deepwater prospect. The FPSO solution also addresses issues related to the lack of infrastructure, complexness of the seabed, and unique reservoir characteristics. The oil from the FPSO will be transported to US refineries using tankers. Transfer of crude oil to the tankers will be facilitated by technology designed and supplied by Techflow Marine. The system will provide safe and efficient tandem mooring and offloading operations between the FPSO and Shuttle Tankers.